Ceramic products are not only unique in shape but also in their decor. Very interesting in their form of decoration are two deep basins which are currently belonging to the collection of the Museum of Folk Art Production in Stupava. They are common pottery products, fashioned for the serving of soup. Their creator is master Jan Konyves (1919-2011) from Pukanec. 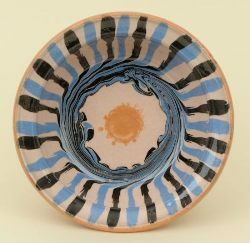 From the outside the bowls are simply decorated with stripes and a wavy line in the middle. On the inside is a technique used in decorating known as “trasakovanie”, which involves a single rotation of the potter's wheel. It is a technique prevalent in old ceramic culture. Its charm, which plays a role in the properties of ceramic materials, captivates viewers even to this day. From time to time this technique can be seen in the products of contemporary masters.